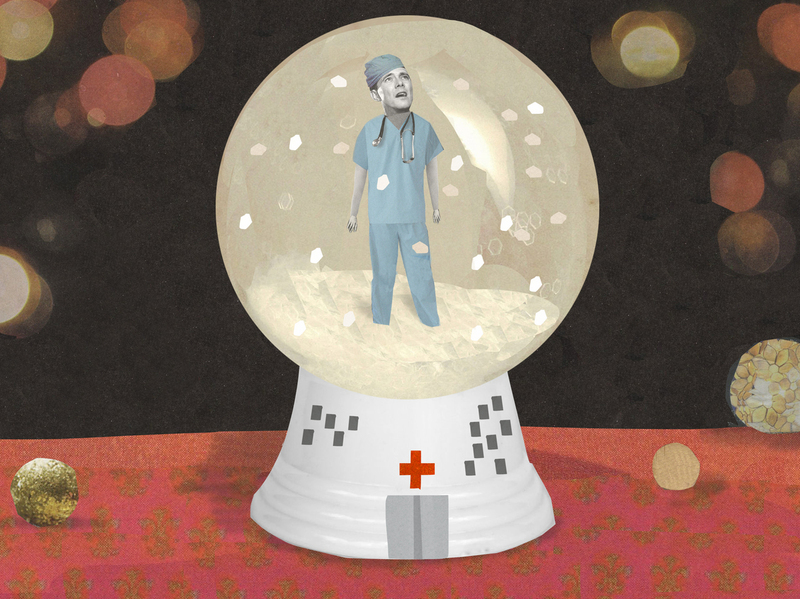 Medical Residents Find Meaning In Holiday Shift : Shots - Health News In late December, medical interns are halfway through their first year of hands-on work with patients. The holiday season marks a special challenge as these doctors take on more responsibility. In what has become a holiday tradition for Shots, we're encoring a piece by Dr. John Henning Schumann that first ran in 2013. He reminisced then about a difficult assignment during his medical residency that helped him understand what it meant to be a good doctor. December is supposed to be the time of year filled with family gatherings and holiday good cheer. For medical residents, quite the opposite is true. There are no school breaks during residency. Being a medical resident is a real job, and a stressful one at that. Residents work long shifts, as long as 24 hours straight and sometimes even 28 hours when needed for patient handoffs. For many of our trainees — especially those fresh out of medical school — this will be the first holiday season without time off. It's well-known among residency program directors like me that interns, trainees in their first year, enter the doldrums as daylight wanes and they have to come to and leave the hospital in cold darkness. At holiday time, interns are approaching the midpoint of their year. That's long enough to feel committed to their chosen path but not nearly far enough along to see the finish line's banners. Doubts amplify. Combine the low emotional ebb with the knowledge that more of our patients die at this time of year, and interns feel understandably vulnerable. Many wonder at this point if they've made the right professional choice. In extreme cases, they wonder if they'll survive. I remember lamenting my first December having to work straight through. A wise mentor helped me reframe my self-pity. "It's a privilege to work on Christmas," he told me. "Our patients count on us. You may not want to be in the hospital, but think of what they're going through." He smiled, as if he were welcoming me to a special club, one that I wasn't wholeheartedly ready to join. "Your mere presence helps reduce each patient's sense of loss." I was rotating in intensive care, where the outlook for patients can be quite grim on any day, regardless of the season. A 30-something patient I'll call Will was brought in after paramedics found him unconscious on the street. He was in a coma. We didn't know the cause but set to work trying to give him every opportunity to arise from the slumber of his critical illness. I was on the rotation with two other interns. We took turns spending nights in the hospital — each of us taking every third night on call. The first night, my buddy Paul spent the night at Will's bedside trying to figure out a way to replenish his body with fluid, given the massive output that was draining into his urine bag. Will had suffered a brain injury. One effect was diabetes insipidus, a condition that meant his kidneys couldn't hold on to his body's water. The result can be rapid dehydration and death. Paul's work saved him. Paul squeezed a few bags of IV fluid into Will to rehydrate him and administered a drug called desmopressin that restored his water balance. I was certain I wouldn't have known what to do. It soon became clear that Will wouldn't recover from his brain injury. His brain had simply been without oxygen too long before Will got medical attention. When it was my turn on call, the instructions were simple: Keep Will alive until his relatives could come and say goodbye in person. Will's grieving mother had expressed the wish, and we felt honor-bound to make it happen. We saw ourselves in Will, and his mother could easily have been our own. Two days later, when everybody had said their goodbyes, we somberly withdrew the ventilator keeping Will alive. He died soon thereafter. Years later, reflecting on my first holidays in the hospital, I realized that my mentor's wisdom had been crucial. That December, Paul and I had started the long process of becoming professionals. Editor's note Dec. 26, 2018: This story was updated from the original version to reflect a relaxation in work-hour restrictions for first-year residents.